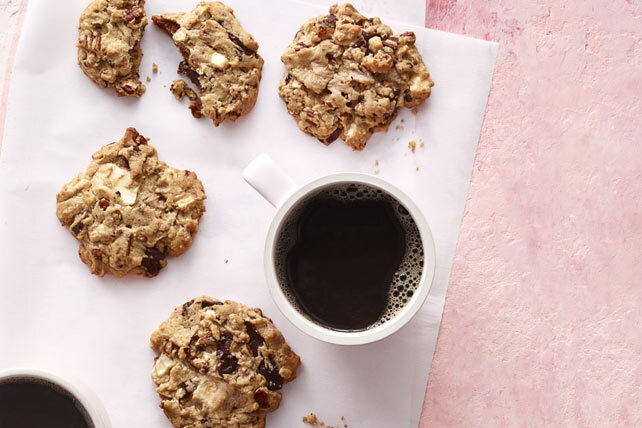 These yummy peanut butter cookies get their chunky appeal from chopped chocolate and toasted pecans. Mix first 3 ingredients until blended. Beat peanut butter, butter and sugars in large bowl with mixer 4 min. or until very creamy. Add egg and vanilla; beat 3 min. or until fluffy. Stir in flour mixture until blended. Stir in remaining ingredients. Drop heaping tablespoonfuls of dough, about 1 inch apart, onto baking sheets; press lightly to flatten to 2-inch diameter. Bake 9 to 10 min. or until lightly browned. (Do not overbake.) Cool on baking sheets 5 min. Remove to wire racks; cool completely. Enjoy your favorite foods on occasion, such as these delectable cookies, but remember to keep tabs on portions. Bake an extra batch of cookies to share! Place the cooled cookies in resealable containers and store at room temperature up to 3 days, or freeze up to 2 months.